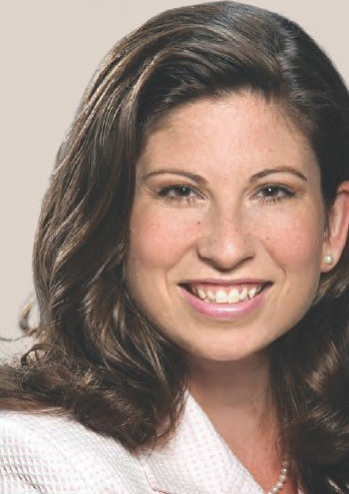 One of the catalysts determined to position Delaware as a focal point for business sustainability is Melanie G. Smith, who currently serves in the state’s House of Representatives and is an attorney at Richards, Layton & Finger, where she began her career practicing law shortly after clerking on the Delaware Supreme Court. In recent years, she has focused many of her efforts on creating a framework that in the coming years will be known as the “Delaware Certificate” for transparency and sustainability. Throughout her career, Representative Smith has been committed to advancing and strengthening the global sustainability movement, and most recently sponsored legislation in Delaware to promote a sustainability option for all Delaware-incorporated entities. Smith’s passion for sustainability dates back to when she enrolled in law school with a goal to become a human rights attorney. When Smith returned to her hometown of Bear, Delaware, she came across few opportunities aligned with her passion, but soon landed with a law firm that had a strong pro bono program. To this day, she still does work related to social issues including foster care and abused children. And while doing such advocacy work, she continued doing research on the pro bono work of other law firms. She then became intrigued by the work various law firms were tackling when it came to sustainability. “I literally went down the rabbit hole, and haven’t come up yet,” Smith said as she spoke with CR Magazine from her office in Dover. 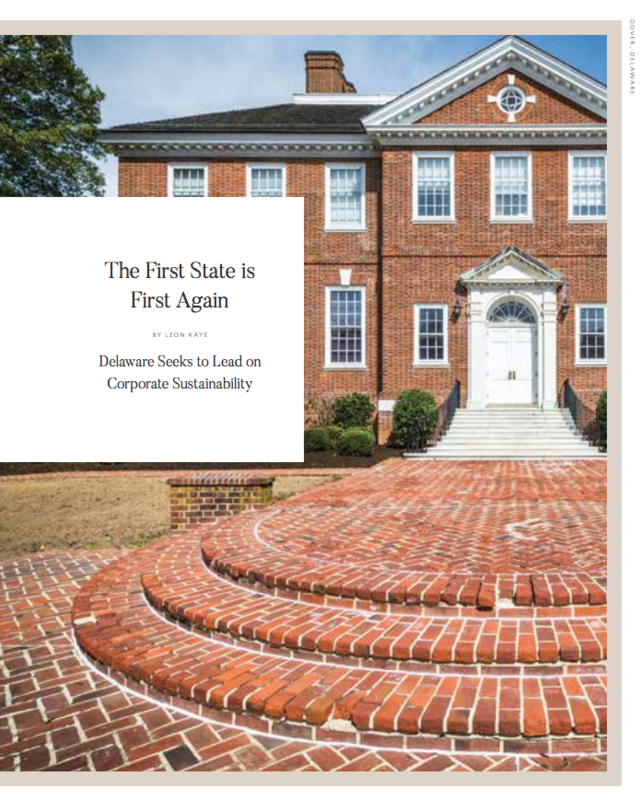 And Delaware is the perfect place to lead on corporate sustainability. It is no secret that Delaware has long had more companies incorporate there than any other state (in fact, 1.3 million), due in a large part to the corporate law expertise at the state’s Court of Chancery and the fact that corporate case law is far more extensive in Delaware than any other state. Their courts are also well-known for their fast turnaround times, crucial if a company has to close an acquisition deal quickly. Furthermore, companies are also quick to incorporate in Delaware because of the state’s strong privacy protections. The bottom line for a company considering filing papers in Delaware is that by incorporating there, it sends a message to investors it is a national company. Now, national and local companies find themselves rethinking their approach to business. 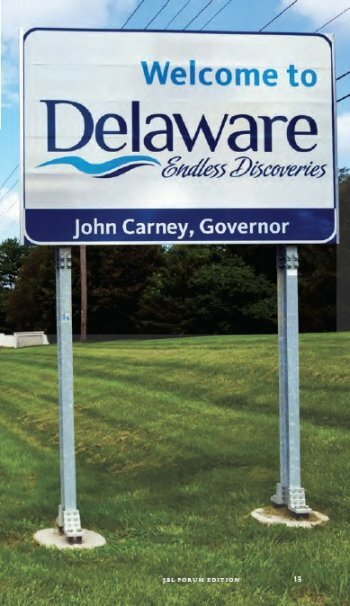 At a time when investors are increasingly pushing companies to become more transparent and address long-term sustainability more seriously, Delaware is primed to take leadership on this challenge – and could have influence far beyond this tiny state’s borders. “Delaware is a leader in supporting businesses through our corporate laws, and sustainability is about how they can adopt different strategies to make a difference in the world while improving their bottom line – so taking on this challenge was a no-brainer,” explained Smith. Hence the light bulb began to blink above Smith’s head, as she began to explore an idea of a Delaware sustainability certification as a tactic that companies could adopt in order to signal to the market their commitment to responsible business. Transparency, of course, was one challenge. “We wanted to make it clear to companies that transparency would send a strong signal to the marketplace that these companies are all in,” Smith said. "Combining this level of transparency with a board's commitment to sustainability shows among the highest levels of true commitment by a company to sustainability. These aren't companies just using sustainability for a marketing bump." Cognizant of the fact that one set of sustainability guidelines applicable for one industry may not be suited for another sector, Delaware’s legislation gives companies flexibility for how they disclose their work. Requirements include documentation verifying the approval by a company’s governing body, such as its board of directors, of any sustainability disclosures and reports. The reporting company must also show that any such reports are publicly available on its website with direct link to those reports. In addition, the company must submit a statement that explains the standards and assessment measures the company uses. Upon the payment of a nominal fee to the Delaware Secretary of State’s office, the company then receives a certificate verifying its transparency and sustainability standards. Companies participating in this program must renew annually, while confirming that the latest sustainability reports are updated on their web sites. Key to the success of this platform is the fact that it is completely voluntary. “I’ve spent many years working with the business community and want to ensure that companies feel comfortable doing business with Delaware,” said Smith. “We want this done in a way where they can take the time to secure internal buy-in, and that the decision to pursue this certification is by organic decision making – not by what the government is telling them what to do. According to Hugh Welsh, general counsel, secretary, and president of DSM North America, the Delaware Certificate will become a new standard allowing the market to differentiate between companies that are authentic in their pursuit of sustainability goals, and those for whom it is just rhetoric. “This certification will ensure transparency in the reporting of sustainability targets and achievement allowing all stakeholders to see and judge the work responsible corporations undertake every day to be better stewards of the environment, consumers, employees, and the communities within which we live and work,” Welsh told CR Magazine. As with any new legislation, it will take a while to measure the impact of this law. But Smith made it clear to CR Magazine she is far from done. She has also taken the lead in launching the Sustainable Delaware Commission. The commission includes the presidents of the state’s three higher education institutions; the mayor of its largest city, Wilmington; the president of Delaware’s largest health care system; and the state Governor's key cabinet secretaries, including those that head the departments of transportation and environment; as well as the Secretary of State, its budget office, legislators and business leaders. The goal is to make Delaware more sustainable by undertaking two strategies. First, the commission seeks to review all of its operations, from the state’s fleet of vehicles, to its buildings, to Delaware’s 30,000 employees, its procurement dollars, and pension investments. In addition, Smith envisions an infrastructure in Delaware that supports (and again, not to regulate) sustainability among Delaware’s various organizations, whether they are part of the the business community, nonprofit sector or local governments. “We will seek a workforce trained in, valuing, and understanding sustainability and the innovative design thinking that it requires. And I want us to provide technical assistance to small- and medium-sized entities so they can participate in the supply chains of the larger businesses that are starting to require sustainability with anyone they do business,” said Smith. In the end, Smith sees a Delaware that is environmentally and socially responsible, and most importantly, economically sustainable. It’s quite the ambition for a state that for many of us, is only known as the one that became the first to ratify the U.S. Constitution on December 7, 1787. Now, Smith wants Delaware to be known as the First State in the 21st century for other reasons. “If Delaware can get this right, we could become a laboratory for other states – and even for the world,” Smith said.